For our July Date (from our Year of Dates) Adam and I took a pizza making class! I booked the class with Classic Cooking Academy, a culinary school in Scottsdale. They offer recreational classes to the public in addition to their culinary programs. 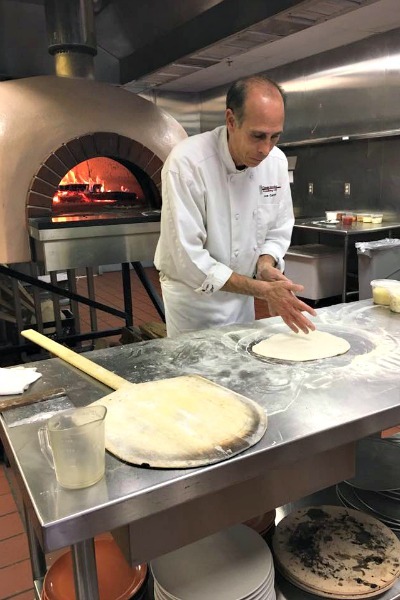 The recreational classes offered are a Friday night gourmet cooking class, Saturday morning/afternoon pizza making, a Sunday Brunch class, and a Five Course Wine Dinner (not a hands-on class). 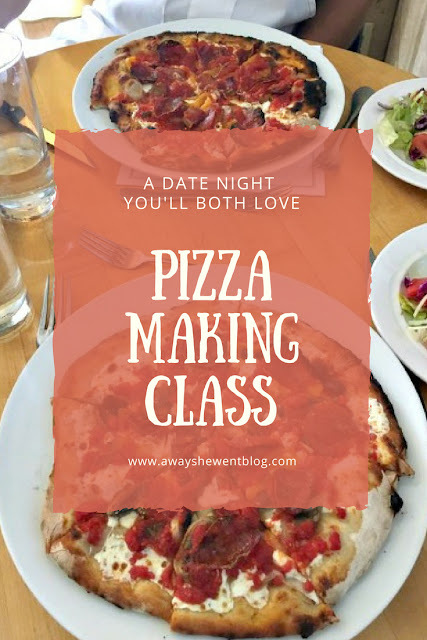 I picked the pizza making class because it sounded like so much fun and I loved that we would each get to make our own pizza! The class was from 10:00 a.m. – 12:30 p.m. on a Saturday, which was perfect for a pizza lunch! There were 9 people in the class (including us) and it was the perfect size. We all had plenty of room to work and were able to cook our own pizzas in the big wood burning oven. Our instructor said that in the larger classes, they do the cooking so they can move the pizzas in and out faster. The class started with an introduction to the wood burning oven and tips on how to best cook pizza at home (buy a pizza stone). Then we learned all about dough - the best flour to use (Caputo 00), how to properly knead dough, and how to tell when it’s ready to use. And then it was pizza time! 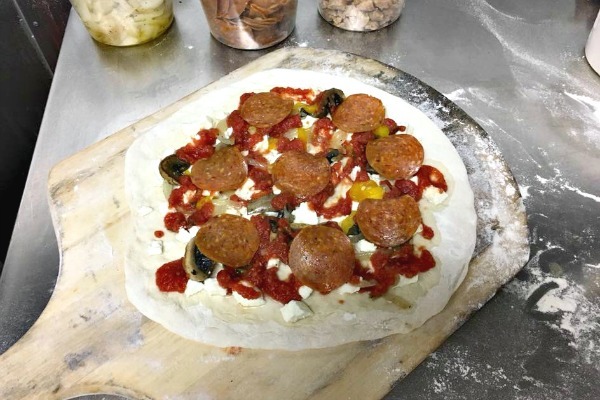 Our instructor showed us how to stretch and shape our crust and the correct order for toppings. After that we moved to our stations and made our own pizzas! It was fun to work with the dough and my crust turned out almost perfectly round (one weird flat section). I topped my pizza with fresh mozzarella, sautéed mushrooms, onions, and peppers, sauce and pepperoni. Then we got to put them in the wood burning pizza and help cook them! We had to turn them once and then pull them out after a few minutes. They didn’t take long to cook at all. Finally it was time to eat! We had our pizzas, plus our instructor made a side salad with a delicious herb vinaigrette dressing and beer or wine (or soda/water). For dessert we had an amazing chocolate mousse with biscotti. Everything was delicious and my pizza ended up being one of the best pizzas I’ve ever had! We had such a fun time and learned some great tips about making pizzas and cooking in general. 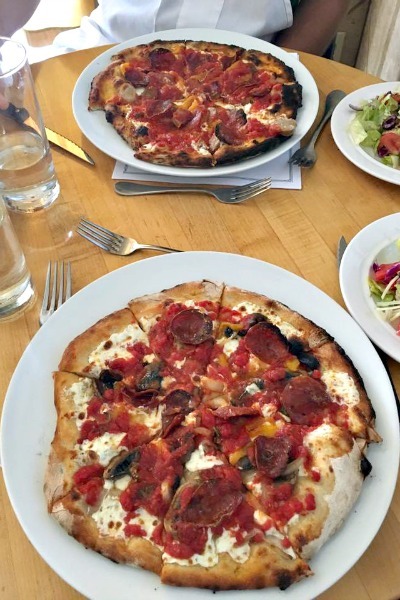 It was SO different from anything we’d done before…not your typical pizza date! So if you’re looking for a date night idea, I highly recommend trying a cooking class! *This post contains some affiliate links. I receive a small percentage of the purchase price at no additional cost to you. Thank you for reading and supporting my site! How fun! I wish we had a place like that around where I lived. Maybe I will have to do some research! You should look into it! There might not be a pizza class nearby, but there could be a cooking school that teaches other classes. There's a few by us that do a couples date night class on Fridays. I think that would be so fun too! Umm I would love to take a class like this! My husband would love it too! We both had such a great time! We love pizza. I would not think twice before taking this class. Love it ! Us too! Who wouldn't want to learn how to make pizza?!?! I heard that this is the perfect way to make pizza. I mean on real fire, not in the modern oven. Yes! It turned out perfectly crisp and was so delicious! This looks so fun! 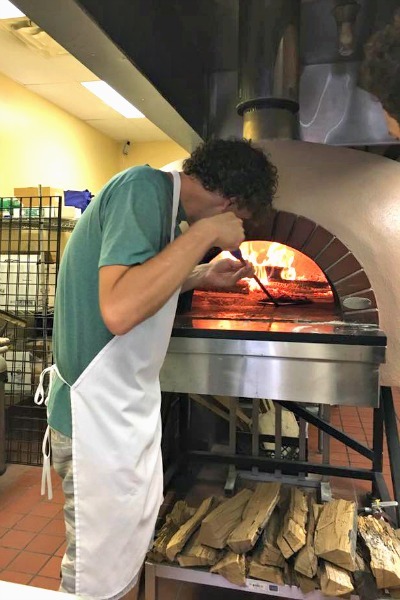 Everytime we visit a restaurant that has a wood fired pizza oven like this we always talk about how fun ti would be to learn! It's so fun! Maybe there's a class near you! This sounds like an amazing date idea. One of our local hotels offers a cooking class. I need to sign my hubby & I up. He's never really cooked, so I think it would be fun for him to try. You should! I think even someone who doesn't cook much would enjoy it!